The Practice screen is used to enforce everything that you've learned in the lessons by generating thousands of practice questions that you can use to test your knowledge and burn the fretboard theory into your mind. But unlike most "fretboard training" applications, these exercises don't just ask you to find random notes or reproduce scale patterns from memory. Instead, they are carefully structured to reinforce the lesson content and build your fretboard knowledge logically. As you complete lessons, Guitar Notes Master will automatically add exercise sets that include questions on the topics of each lesson to your Practice List. When you're ready to practice, simply load up Guitar Notes Master and switch to the Practice screen. Guitar Notes Master will quiz you with random questions from your current practice list to help you memorise everything you've learnt so far. Of course, once you're confident with a particular lesson then you can remove it from your practice list, ensuring that your practice questions are always tailored to your needs and making your learning as efficient as possible. 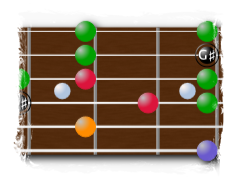 Performing practice exercises on the Virtual Fretboard also has the advantage that you can focus on fretboard theory in isolation without the distractions caused by technique, rhythm and tone issues that you might also be dealing with on a physical guitar, allowing you to get the fretboard knowledge clear in your head before you are ready to transfer it to your guitar. With all of the practice taking place on the Virtual Fretboard, you can practice at any time you can use your PC, even when you can't play your guitar. This can really speed up your development as a guitarist, enabling you to maximise your practice time even with the busiest of schedules. Why not install Guitar Notes Master on your laptop so you can practice on the move as well? Effective learning can be encouraged by practicing little and often, so the Guitar Notes Master method encourages you to quickly launch the application and start practicing for short periods throughout the day. Couple this with regular structured practice sessions on your guitar and you should see your playing ability rocket!